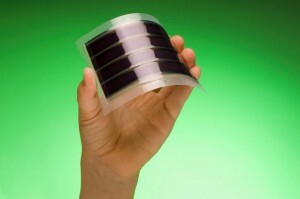 Flexible solar cells from G24 Power are lightweight and thin, yet robust and durable to withstand everyday use. Highly flexible – Tested to withstand flexing over 10,000 times around a 25mm radius with no measurable drop in performance. Robust – Tough enough to withstand impact, drop tests and compression making it durable enough for everyday usage without fear of breakages. Thin – Adds the minimal amount of thickness to any product application approximately 1mm – circa the thickness of a credit card. Lightweight – Easier to transport, lower logistical costs and eliminates the risk of breakages during shipping when compared to heavier, brittle glass modules. GCell is precision engineered on flexible materials giving designers a versatile plastic flexible solar cell that can be flexed or curved in its product integration. Unlike rigid glass solar cells, they have a low profile, for better integration with the application. GCell is often integrated flat within product applications with good aperture design and oriented towards a light source for optimal energy harvesting. As a potential saving to the system cost, flexible solar cells often only require an adhesive double-sided tape to fix their position within the product application. With GCell there is no requirement for additional housing or fixtures often used to secure and protect glass silicon solar cells. Mechanically robust and flexible solar cells used in the integration of portable electronics give the user the freedom to move around with the confidence that the properties of GCell can withstand the impact of the drop and will continue to harvest energy to their device. The flexible nature of materials used in the construction of GCell opens up attractive and innovative possibilities for new and existing product applications where the appearance of flexible solar cells is an important consideration. We see that in the near future a new wave of improved materials can be used to achieve attractive colour and aesthetic effects. For more information on GCell and the integration of flexible solar cells visit Integration of solar cells.